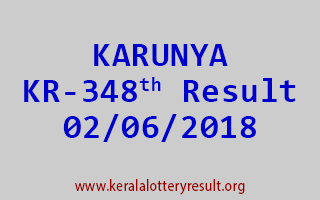 KARUNYA Lottery KR 348 Result 02-06-2018: Karunya KR-348th Lottery Draw Result held on 02-06-2018. Today’s latest Kerala lottery result published. Kerala lottery result June 2, 2018. Those who are waiting for the Karunya KR-348th Kerala lottery result can now check the online lottery result here.